This verse may be second to Romans 8:28 (one, two, three articles on this passage) in the Guinness Book of Work Records for most frequently misused or unhelpfully used verses. Like Romans 8:28, this verse contains transformative truth (which are often very helpful and timely), but both passages are prone to be offered with dangerous clichés or to infer applications that are not part of the verse or the heart of God for the struggling individual. Does this passage say that we do not have any unique experiences? Does this passage say that we can fully relate to another person’s experience because of something similar in our own history? Was Paul trying to reduce particular challenges down to their least-common-denominator so that he had the authority to counsel them all within his basic repertoire of helping strategies? Does the fact that I was “profiled” in college as a cheap-tipping college student and given lesser service by waiters allow me to relate to the experience of being racially profiled? Does the experience of having a nagging uncertainty about whether I locked the house when I left allow me to relate to the experience the debilitating belief-behavior patterns of someone with Obsessive Compulsive Disorder? Does the experience of shame after being picked on in school allow me to “know” the experience of shame that follows being sexually abused as a child? Based on I Corinthians 10:13, would Paul want me to say to those I counsel, “Yes, I know what you are experiencing and I can tell you how God helped me deal with those struggles”? Or, would Paul condone me saying, “Because I’ve thought through how the Bible speaks to my experience on something similar, it has equipped me to speak to your experience”? Or, would Paul approve if I said, “Your experience is not unique. You should not live as if your experience is different from the common experiences of offense, anxiety, and shame of everyone else”? The problem is we do not have to say these things in order to say these things. I don’t believe most Christians would approve of the latter statement. 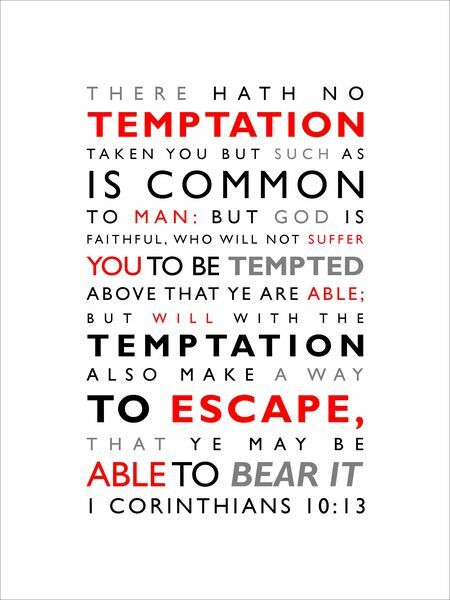 However, if we use I Corinthians 10:13 to draw a false parallel between dissimilar struggles, offer advice based upon that parallel, and tell people this is what God’s Word says should resolve their struggle, then we are (in effect) making the second statement. What happens if we use I Corinthians 10:13 to devalue unique and personal experiences? We offer bad counsel even if it is from a good source (i.e., the Bible). It is the equivalent of seeing someone fall down and offering them help based upon the experiences we have when we fall down. But it may be that their fall resulted in a second degree ankle sprain and we had the comparably good fortune of only getting cuts and scrapes. The Bible has much more to say to these struggles like offenses, anxiety, and shame than we have studied or utilized. But the more we use 1 Corinthians 10:13 to downplay the unique aspects of someone’s struggle, the less we will search for these approaches. The result is that the advice given tends to be simplistic (i.e., directed towards the lowest-common-denominator of the individual’s challenge) or anecdotal (i.e., based upon “this is what worked for me” which assumes a commonality of the two struggles). In either case, “common to man” gives permission for the helper to reinterpret the helpee’s struggles into the categories of his/her own experience or pre-established categories. How, then, do we begin to turn towards hope? If the Bible does speak to all of life and intends to use people like us to communicate that hope, how do we proceed? We begin by realizing that the Bible says only one person can relate to every human experience – Jesus. Does this mean Jesus was racially profiled, had a chronic doubt of God the Father’s acceptance, and was raped as a child? Yes, no, and not that we know (although he was publicly crucified naked). He was a Jew and that contributed to His crucifixion. He was unswervingly confident of God’s love outside His time on the cross. We know little of his childhood outside a couple of prophetically significant events. How then can we say that Hebrews 4:15-16 is true? Would Jesus have needed to have had leprosy, Downs Syndrome, Lou Gehrig’s Disease, and Alzheimer’s in order to sympathize with our every weakness? No. The greatest extent of being misunderstood, rejected, abused, lonely, tempted, forsaken, and any other nightmare we are incapable of dreaming was experienced by Christ as He condescended from Heaven to earth and experienced Hell on our behalf. Yet notice what this passage does and doesn’t say. It doesn’t say it is Jesus’ suffering that gives Him the wisdom or power to restore our souls. It does say that it is Jesus’ suffering that gives us confidence in His ability to relate and draws us to receive the mercy He offers. God, as omnipresent and omniscient Creator, does not rely upon personal experience as we do to have understanding. We should be humble in how we approach the suffering and sin of others who honor us with the opportunity to be Christ’s ambassadors to the rawest areas of their life. Humility, in this kind of situation, would mean not using I Corinthians 10:13 as a “fast forward verse” that allows us to maneuver the conversation to a subject or approach to helping with which we are more comfortable. Humility may also require me to acknowledge that while their struggle is “common to man” it is “foreign to me.” Music is common to man, but foreign to me. Eight painful years of piano lessons as a child proved that music is hard for me. Why would I be hesitant to acknowledge that about the attachment struggles of adopted children or the wise timing of restoration in an abusive-manipulative marriage? Humility always means listening more than we talk. It likely means not offering advice that comes with the authority that referencing Scripture implies until my questions are generating a sense that I understand you and that you are beginning to understand yourself better. Humility would also mean having the confidence that my confusion is no indicator of God’s lack of understanding. 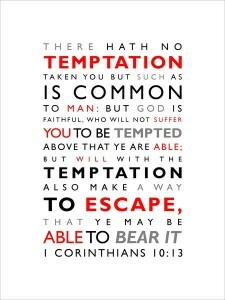 It may be that during the time of uncertainty that I (the counselor) need to be reminded of I Corinthians 10:13 more than you (the counselee). And this reminder prevents me from giving way to the fear that causes me to rush, listen poorly, or force “next steps” that are not fully warranted (at least not based on my current understanding and your sense of being understood – trust).